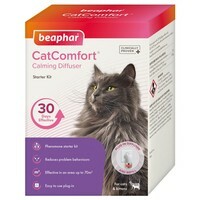 Beaphar CatComfort Calming Diffuser uses pheromones which are recognised by your cat to promote feelings of reassurance and help reduce unwanted behaviour. The CatComfort Diffuser contains a copy of the naturally produced cat facial pheromone, which is recognisable by your cat and helps them to feel more at home. This reduces common problems such as inappropriate scratching, urination, fear and fighting, or general feelings of anxiety. Designed to give a continuous and reassuring message to let your cat know an area is safe for them to be in, the Beaphar CatComfort is especially beneficial when there are changes to your cat’s environment, such as moving house, a new addition to the household or even moving the furniture. The easy to use plug in diffuser can be placed anywhere within your home, and is effective for up to 30 days with continual use before needing a refill.